05-Aug-2002 -- Our nine person two-week Sierra Club Outings backpack group - North Across the Brooks Range Divide - had been deposited on the Sheenjek River in the Arctic National Wildlife Refuge by our intrepid bush pilot Kirk Sweetsir of Yukon Air Service. We had hiked for two days up the river getting our bodies ready for the mountain crossing to come. A few miles to the north was the glaciated pass, but a few miles to the west was the 69N 144W degree confluence I had noticed last year on a similar journey. We needed a further tune-up and a break from hauling heavy loads so we donned our daypacks and started off, eager to try for the first north-of-the-Arctic Circle confluence in the western hemisphere. This part of the Brooks Range in early August is green tundra in the valley bottoms with grey rocks on the surrounding mountains ridges. The tree line is 20 miles south so except for low willows in the bottoms we were in open country. After a few miles of river bank travel and some mushy tundra we turned south up a bare narrowing rocky canyon which we hoped would let us get close to the confluence point, about 2000 feet higher on a spur ridge of an un-named glaciated peak. 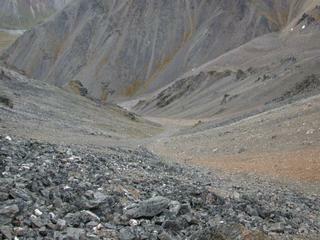 When the GPS said we were at 69 degrees we turned west, awed by the steep 1200' scree-gully which led to the ridgeline. It was slow work with considerable backsliding and many rest stops. Most of us got to the top however, and were amazed both at the view and the closeness of the actual confluence to the narrow ridgetop. The GPS showed 69 00' 00" and 144 00' 6.7"secs and we took shots of the Sheenjek River valley to east, the snow-clad peak to the south and the glaciated valley to the southwest. As the wind was picking up and clouds looming we began to scuttle slowly down the loose scree about 50 yards east and a hundred feet lower to the true confluence point. A short celebration was all we got as it was time to drop down into the canyon again. An hour later we were hiking back through snow showers and wound up fairly wet and cold upon returning to our camp. Some more snow fell that night and in the morning we could see the confluence ridge now covered in white. This adventure gave us a good foretaste for the rest of our trip. We had several more snow showers - once a foot of snow on the ground - had to alter our route to lower passes to get to the north slope. At the end we had to wait two extra days for the weather to clear for our pilot pick us up. Locals called this August this coldest in many years. We had learned the basic lesson of Arctic travel - expect the unexpected and have a good time anyway. #2: View South and west from confluence ridge to remnant glacier. #4: Group on confluence ridge at 69 00' 00" 144 00' 6.7"
#7: Confluence ridge from our camp the morning after our visit.